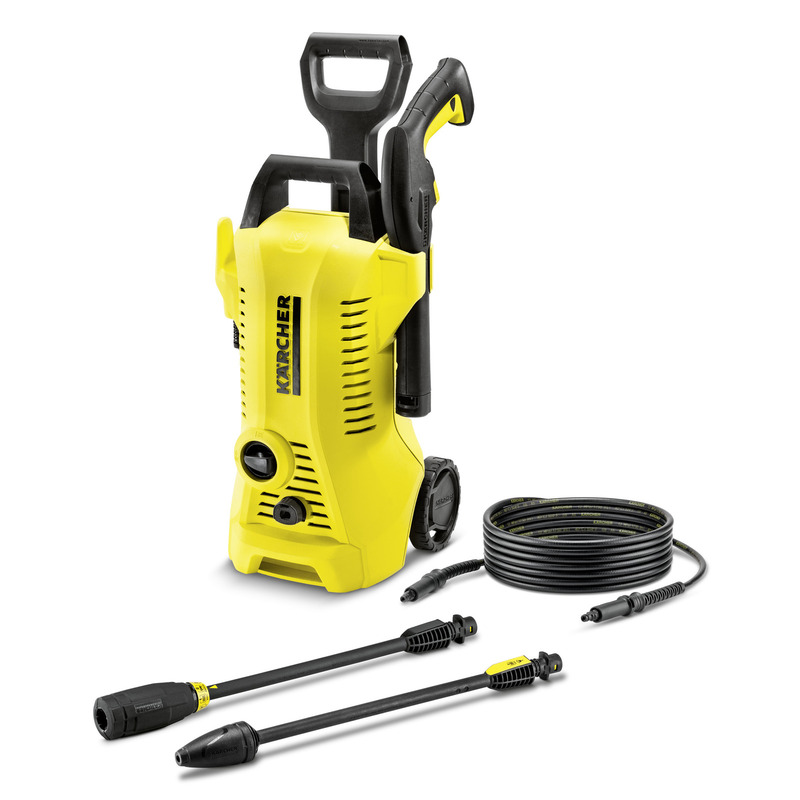 K 2 Full Control 16734020 https://www.kaercher.com/ie/home-garden/pressure-washers/k-2-full-control-16734020.html The K 2 Full Control is a powerful and lightweight power cleaner, which gives you targeted pressure regulation for light dirt, found on bicycles, garden tools and garden furniture. The K 2 Full Control power cleaner is designed for occasional use and removal of light dirt around the home, including dirt on bicycles, garden tools or garden furniture. With extendable handle and wheels to make it easy to transport and store, while the built in suction tube makes applying detergent easy. Included with the K 2 Full Control is a 4m pressure hose, Dirt Blaster with rotating point jet for removing stubborn dirt, water filter to protect the pump against dirt particles and the Full Control Vario lance. The Click Vario spray lance features three pressure settings: soft, medium and hard, as well as the mix detergent mode, which can be adjusted easily simply by twisting the lance. The symbols on your spray lance gives you clear indication as to the pressure setting required for the different surfaces around your home. This machine comes with a 2 year warranty. K 2 Full Control is rated 4.4 out of 5 by 19. Rated 4 out of 5 by Pedro63 from Not as good as my first K2 bought 18 years ago This is my second K2, first one is past it's best now. The quality does not seem the same, body seems flimsy as does the handle and hose. Will see how it performs against my old one but not impressed some far. Rated 4 out of 5 by Redseagerry from Small machine with adequate strength I purchased this item with a view to cleaning off small garden wall blocks and car washing. Although it is very light weight and small it is adequate for my occasional use age in a small garden however if you have a big garden and use it frequently I would advise anyone to go up to the next bigger machine. Rated 5 out of 5 by DD25 from Great tool Have always used karcher, my old is 12 years ago, just thought I would get a new one. Rated 3 out of 5 by Geoffthemeff from It does the job. I’m quite happy with the purchase but wasn’t going to go with Karcher again after my first one completely knackered with little use in just over 12 months. As usual the hose (made of plastic) just kinks and once kinked becomes permanent and it’s almost impossible to wrap up the hose or wash the car without kinking it and it’s infuriating (what’s wrong with a rubber hose??). Just on that alone If I’m in the market again to purchase another it will be one with a practical hose and not a plastic one which I suspect is a popular replacement part £££. Rated 4 out of 5 by storm138 from Good pressure washer I bought this directly from Karcher who delivered it swiftly. The Karcher is great for washing the car, which is what I plan to us it for. I found it was great for removing the mud and grim that covered my car, which normally requires a lot of hard work. I found I was able to wash the car in about half the time. It is easy to put together and use. My less favourable comments are that its not easy to put away the power lead, or the high pressure pipe. I have wound mine around the machine as its the neatest way, but a more considered design could resolve this. Also if you join the two wand elements together they don't sit in the holder on the side joined together. They will however sit on the machine for storage when not in use, but someone didn't think about the in use option. The handle the allows you to pull the machine along is firm, however it drops down far too easily. I also bought a Karcher FJ10C Foam Nozzle, which didn't cover the car in foam as I expected. That said I think it helped clean the car and am planning to use a different refill soap when this one has run out. All this said I would not buy the next model up, I think for how I plan to use this I am generally happy with the product considering what I paid. Rated 4 out of 5 by chief washer from Nice! Does was it says on the tin... Very easy to use, light and compact for storage.